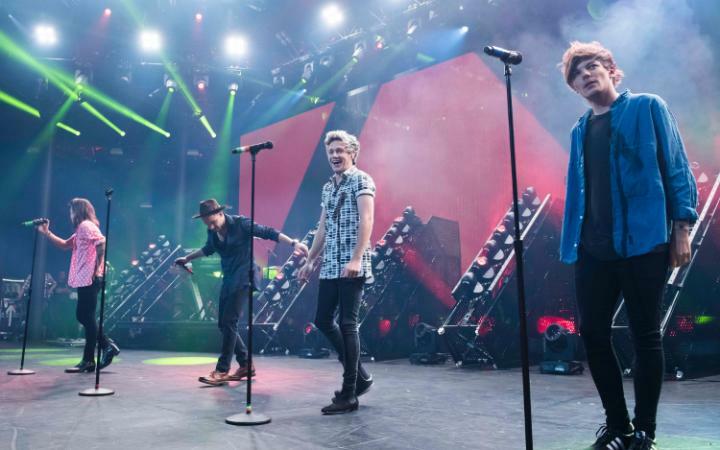 Wait, irony aside, we just really enjoyed One Direction at the Roundhouse. Now in its fourth day, the inaugural Apple Music Festival saw teen scream icons One Direction roll into town on the back of a new album announcement. Just a week before they begin a huge arena tour, it provided a chance for fans to catch a rare glimpse of their heroes up close and personal. They were supported on the night by a band also formed on the X-Factor in Little Mix. It could be argued first and foremost that the four piece could easily have been headlining the venue. They began their set a little early, playing fan favourites such as 'Salute' and 'Move', kicking off in style. Playing without a live band, they were joined sporadically by a group of dancers. We hear an exclusive song in 'Grown' and are treated to a wonderful rendition of 'Little Me', capped off by strong vocals from Perrie Edwards. There's also a UK debut live performance of a new song entitled 'The End', which had only previously been played at US shows. To conclude, 'Black Magic' is played and goes down a treat with the crowd. An inspired choice as support, the crowd sings every word back with dedication and warms an, already simmering venue, up for the main act. As One Direction gear up for the release and tour of their fifth album, you'd be forgiven for thinking their Roundhouse show this evening would be the calm before the storm. As I was soon to find out, there is no such thing with One Direction. With five minutes to go, pockets of the crowd erupt in screams. Whether or not they saw a band member lurking in the shadows behind the expansive backdrop or were simply excited I'm not sure. It does however set the precedent for the rest of the evening. Before long a countdown appears on two monitors either side of the stage and their arrival is imminent. 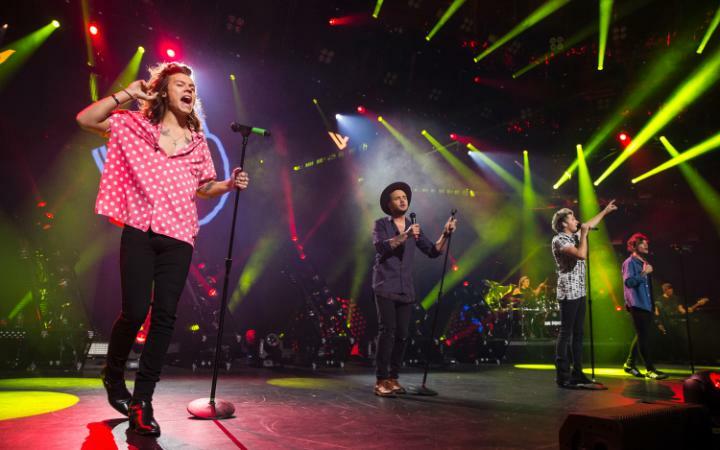 Opening with 'Steal My Girl' proves an intelligent choice. Accompanied by little else other than their live band, Niall Horan takes hold of the guitar for their next number 'Little Black Dress', despite his mystery foot injury. He wanders round the stage wearing a huge boot on his right foot but doesn't let it affect him in the slightest. Harry Styles is energetic, sweeping across the stage to douse water over the front rows, whilst Louis and Liam dominate the centre. Throughout their hour long set we hear a diverse group of songs spanning all five albums. We hear early track 'Midnight Memories' as well as a more recent song, and Liam's favourite, 'Girl Almighty' from the 'Four' album. 'Fireproof' also gets a run out and is an underrated track from their oeuvre. The set is somewhat stop start, Niall appears to be a little under the weather and steps out momentarily before returning to complete the set. Liam takes this time to say thank you to the host of One Direction fans that appear to have camped outside in order to gain their spot on the front row. There's also the touching moment when Harry takes the time to conduct a rendition of 'Happy Birthday' for a girl in the front few rows, before joking that 'Happy Birthday Chloe' by One Direction will be available to buy shortly. They're an endearing bunch but it can affect the momentum at times. The first and only glimpse of music from their new album 'Made in the A.M.' is in the form of its debut single 'Drag Me Down', despite new single Infinity being released earlier in the day. It's a song that sounds infinitely better in a live setting, packing a real sonic punch. They follow this up with their first ever single 'What Makes You Beautiful'which gets everyone on their feet and seems to be their most popular song, whilst it still sounds as instant as it did all five years ago. The final two songs of the night come in the form of 'Story Of My Life' and 'Best Song Ever', both garnering a big reaction. It was always going to be hard to fit four albums worth of songs into an hour long set and there are some notable absences, 'One Thing', 'Gotta Be You' and 'Live While We're Young’ were all left out. We get a varied set showcasing the progress of the band over the years. As they enter their last tour and album cycle before taking a break, they seem to lack an excitement they previously had. This may be due to the loss of Zayn Malik or just natural teen idol fatigue. They have, however, pulled off an immensely accomplished show tonight and it's easy to forget just how young they are when performing, merely showcasing their vast professionalism and maturity. They will have no doubt sent the 2000 strong crowd home with beaming smiles on their faces, as well entertaining as the many fans watching around the world. 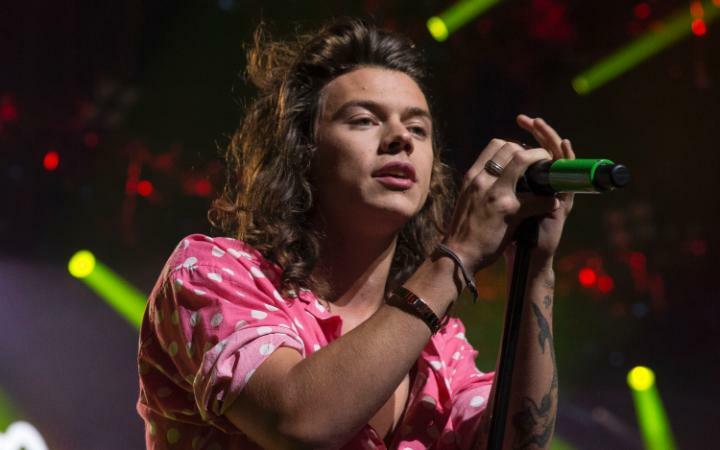 As the Apple Music Festival approaches the halfway mark, One Direction's impressive performance marks another successful night.